A hernia occurs when an organ or body part pushes through a weak spot in muscle or connective tissue into a part of the body that it isn’t supposed to be in. While some hernias can occur at birth, others may form later in life. These types of hernias may occur as a result of heavy lifting, straining, pregnancy and obesity. 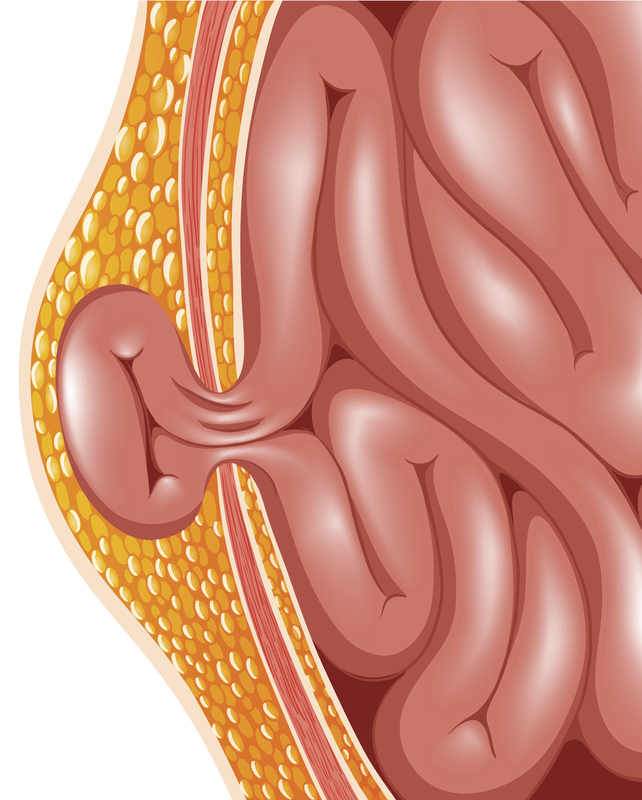 Inguinal hernias – Occurs when a part of the intestine pushes into the inguinal canal. Most commonly seen in males. Femoral hernia -Occurs when the femoral artery and vein pass through the canal between the abdomen and the groin. Most often seen in females. The symptoms of a hernia often depend on where it is located. Some hernias will cause pain while there are others that only have physical signs, such as a bulging out of the skin, but aren’t painful. When a portion of the intestine pushes through a muscle and becomes trapped it can be very painful block the intestinal blood supply. These hernias require urgent surgical attention. A hernia can be prevented by avoiding lifting heavy objects improperly, maintaining proper weigh, care when coughing, having a diet that contains adequate fiber, and avoiding excessive straining during a bowel movement. Treatment for a hernia depends on its location, size and the amount of discomfort. In some cases surgery isn’t necessary and the hernia can be pushed into place and held there by a device called a truss. Surgical options include closing the weak spot in the muscle with stitches, , using a mesh to reinforce the weak muscle that the hernia is pushing through, and laparoscopic surgery to repair the defect that is causing the hernia. If you are experiencing any discomfort from a hernia, it is important to seek professional help to learn what the options are to repair it. You can schedule an appointment with a surgeon at Jamaica Hospital by calling 718-206-7001. This entry was posted in Health, Surgery and tagged hernia, Jamaica Hospital Medical Center by Andrew Rubin. Bookmark the permalink.